Hands wave hello, hands hold, hands heal. Hands say, I am here for you always. In simple, stirring rhymes, author Tony Johnston pens a timeless ode to parenthood. The small moments and quiet scenes that make up childhood — learning to clap, planting a garden, waving good-bye on the first day of school — fill the pages of this gentle tale, capturing the reassurance and love that parents hand their children every day. Warm illustrations by Amy June Bates show a young boy reaching for his mother’s hand as he grows older and more independent . . . until, perhaps, he can be the one to offer love and support with hands that say, I am here for you always. An eloquent look at the passage of time and the power of connection and care, this book is a heartfelt gift for loved ones at any and all milestones in life. Tony Johnston is the award-winning author of more than one hundred children’s books, including Cat, What Is That?, illustrated by Wendell Minor; First Grade, Here I Come!, illustrated by David Walker; and A Small Thing . . . but Big, illustrated by Hadley Hooper. She lives in California. Amy June Bates has illustrated more than forty books for children, including Ketzel, The Cat Who Composed by Lesléa Newman and Applesauce Weather by Helen Frost. Amy June Bates lives in Pennsylvania. This is a beautiful picture book sure to resonate with any adult who has ever loved a child. Meanwhile, kids will relate to the childhood hallmarks represented throughout. The gorgeous watercolor illustrations of this sweet picture book help secure it a place in the hearts of adults who read it. This is a lovely look at a mother-son relationship over the course of a lifetime, represented by their hands—holding, waving, and supporting...The book is unabashedly nostalgic, with sentences on the first and last pages sentimentally showing the circle of life, and full of joy. Johnston (Bone by Bone by Bone) and Bates (The Big Umbrella) never overplay their respective hands—the lilting prose treads lightly, and Bates’s soft watercolor, gouache, and pencil portraits of the mother and son going about their daily lives offer a tender specificity alongside a comforting universality. 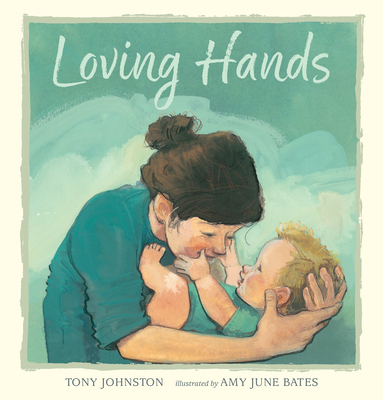 Loving Hands is a delightful book that shows how loving hands that caress, heal, soothe, and support can create strong mother-son relationships. Great for new mothers and grandmothers wanting to bond with their sons and grandsons. The soothing lyrical verse is enhanced by warm watercolor illustrations. Upon reading this, many will want to find small hands to hold and lead through life. —Candace Moreno, San Marino Toy & Book Shoppe, San Marino, Calif.